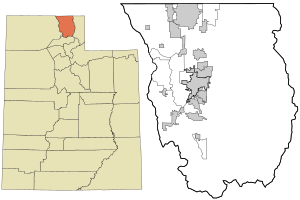 Cache County is a county located in the U.S. state of Utah. As of the 2010 Census the population was 112,656. Its county seat and largest city is Logan. The county was created in 1856 and organized the next year. It was named for the fur stashes made by many of the Rocky Mountain Fur Company trappers. The Cache Valley and surrounding mountains are located in the county, which reaches up to the Idaho border. The Bear River Mountains, the northernmost extension of the Wasatch Range, which reach as high as 10,000 feet (3,000 m), cover the eastern half of the county. The Bear River flows through Cache Valley. Wellsville was the first European settlement in the county, settled by Peter Maughan in 1853. Cache County is included in the Logan, UT-ID Metropolitan Statistical Area. According to the U.S. Census Bureau, the county has a total area of 1,173 square miles (3,040 km2), of which 1,165 square miles (3,020 km2) is land and 8.2 square miles (21 km2) (0.7%) is water. On the western edge of the county lies the Wellsville Mountains and on the eastern edge lie the Bear River Mountains, both northern branches of the Wasatch Range. A canyon carves its way through the Wellsville Mountains. Up this canyon climb U.S. Routes 89 and 91 together. In downtown Logan the highways split, with US-91 heading north into Idaho and US-89 heading east and northeast into Logan Canyon. Taking up the land between the Wellsville and Bear River Mountains is Cache Valley, a relatively flat valley traversed by the Bear River and dotted with small farm towns in the west and the larger, more urban, and faster-growing areas in the east, along the benches of the Bear River Mountains. The county climbs to an elevation of 9,980 feet (3,040 m) at Naomi Peak in the Bear River Mountains. As of the census of 2010, there were 112,656 people, 34,722 households, and 26,464 families residing in the county. The population density was 96.7 people per square mile (37.35/km²). There were 37,024 housing units at an average density of 31.78 per square mile (12.28/km²). The racial makeup of the county was 89.12% White, 0.62% Black or African American, 0.61% Native American, 1.88% Asian, 0.39% Pacific Islander, 5.48% from other races, and 1.90% from two or more races. 9.96% of the population was Hispanic or Latino of any race. In the county, the population was spread out with 36.3% under the age of 20, 12.59% from 20 to 24, 26.97% from 25 to 44, 16.41% from 45 to 64, and 7.72% who were 65 years of age or older. The median age was 25.5 years. For every 100 females there were 98.84 males. For every 100 females age 18 and over, there were 99.53 males. 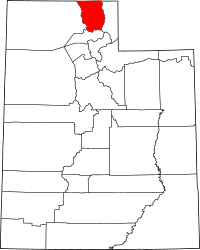 Cache County, Utah Facts for Kids. Kiddle Encyclopedia.